Hi everyone.I'm checking in today with one more look at our beautiful April MMM Kit from C'est Magnifique. Today I have a mixed media card to share with you! I started by creating the base of my card using the Riddersholm Design papers from the main kit. I glued on some layers of paper and book pages and then covered them with gesso. Following that, I applied masking with the April MMM kit mask and modeling paste; set with heat gun. Next, using a palette knife I applied the Lumiere paint over some of the masked areas for pops of color. Once dry, I proceeded to spray (from a distance) the Lindy's Stamp Gang mist and then toss on some mist splats. Inka Gold was applied to the edges of my card. Embellishing came last. I wanted some funky accents for this card, so I applied white paint to the Blue Fern Studios chipboard and then added some of the rub-ons from the MMM kit. The Prima resin frame was accented with the Lumiere paint and then backed up by a Prima Cartographer wood embellishment. Some vintage lace trim from my stash added texture to the linear arrangement behind my embellishments. 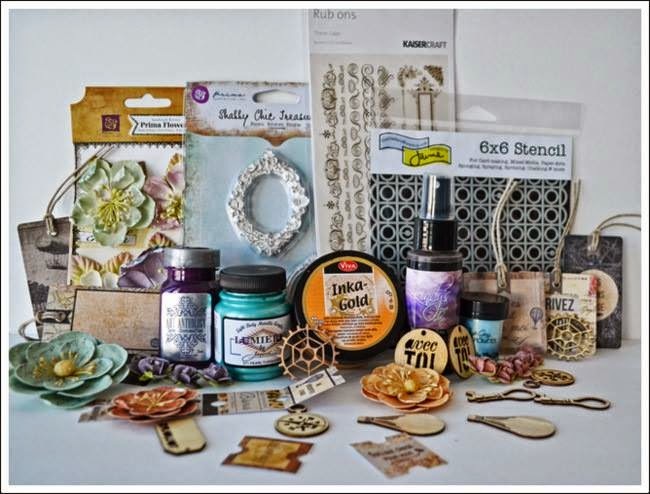 Thank-you for coming by for a final look and farewell to our stunning April MMM Kit! Oooh, yummy layers & I really like how you've used the frames - they look BRILL!!! Fantastic card and amazing details, Erin! Love it! Love this card with all those layers,textures and the pop of blue paint. Such a beautiful care Erin, love the textures and the lovely soft look. Gorgeous card! Beautifully done! Love the texture! Very beautifull card and details so cut ! I really love this! So cool with the bright white and all texture and details! Wow! Hugs!